Lamborghini wanted to overtake the truck. 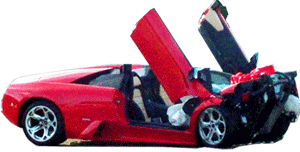 Vehicles brushed against each other and the Lamborghini skidded and ended up on the curb. Lamborghini Gallardo LP 560-4. Happened in Warsaw, Poland.